How about something just a little bit different. This is the first photo posted on this blog that has a real person in it…and that person just happens to be me this time. 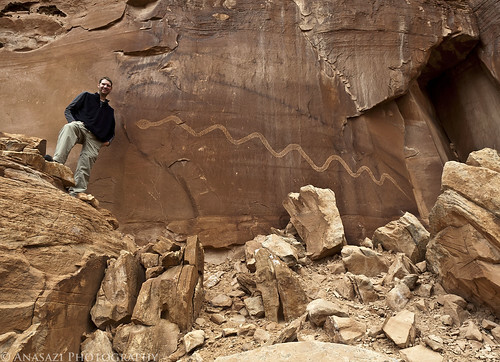 This photo helps give a little scale to the very large Solstice Snake petroglyph and also lets you see just who this person is posting rock art photos on this little blog. This photo was taken many months before the solstice on my first visit to the great serpent.